I moved with twice as much money and after getting an apartment at less than a $1000 a month and purchasing very modest furniture it was still a very difficult start. Did have a crappy job to start and it took 2 months before I got a good job and I am just now (almost 5 months later) finally starting to hold my head above water. My advice would be to save much more than you expect you need and be very frugal when you first get to the city. As much as you may want to stand on your own two feet keeping your parents informed of your situation is vital and if you need their help they appreciate it a lot more if you give them time and information as to your financial situation. While I agree that moving anywhere with a pad of savings is the best idea, I have to say I didn’t follow the same advice. I’m a bit headstrong, and when I have my mind set to something, I do it regardless. So, I actually moved to NYC with $300 emptied from my bank account and a friend in Washington Heights who let me crash on her couch. The economy was much better then – almost 7 years ago – and I got a job working at a gym two weeks after moving here. I slept on my friend’s couch (while paying her a modest monthly rent) for 4 months before venturing out to get my own place. But a lot of everything working out was just plain luck. I happened to have a friend who was more than happy to share her small space to make a little cash in rent each month, and I found a job quickly – although it wasn’t something that paid a fantastic salary. BTW – congrats on the engagement! Heh, gotta kick out of that one. I guess you haven’t met anyone with a rent stabilized apartment yet! I moved to NYC in 1987 ( I was 18 and naive) with a friend and only 67 dollars… I had “small town Pennsylvania” written all over my forehead, and may I tell you that native New Yorkers (if there is such a thing) went out of their way to keep me safe and get me going financially. For example: Complete strangers walked me home if I was alone in a bad area of the city, I was offered jobs, invited to events, given a place to live on the upper east side in good faith that I would pay within a month (and I did). Unbelievable! And I wasn’t beautiful or special in any way! That’s just the way New York City operates… it rises up to meet you, but you have to take the leap of faith first. I’m going back the second my children are out of high school, but this time I’m bringing my teaching certificate and at least 100 dollars. It was 87′ though! That’s more than 20 years ago. I doubt you’d survive with 67 dollars today, even controlling for inflation. My advice would be to move with at least $1500, or whatever quantity you think you can live on for a month. I moved to Manhattan 4 months ago with $70 in my pocket. It was the most inpulsive thing I had ever done. I stuffed two backpacks full of clothes, and thats all I had. I knew no one in New York and had absolutley NO plan!..It was raining that day, and the pair of shoes I was wearing were old and had cracks in the soles, so my feet were soaking wet! By nightfall, my funds had dwendled down to $30 or so. I went into the mall at Columbus Circle and got a few Umbrella bags went into the bathroom took off my wet socks and put on a dry pair, covered my feet with a couple umbrella bags and replaced my shoes. I walked several blocks having NO IDEA where I was going to rest my head that night.I went into a bar ordered a drink and sat down at the bar next to a guy that has been my roommate from that night to this day! !He has fed me, gave me a place to sleep and has even gave me cash for things needed!! I have been extremely luicky and owe him immensely! IO am still looking for employment, and hoope to find something soon so I can get my own place and get on my feet.. Thanks for the realistic advice. I have been wanting to move to NYC for a while now, but after moving to various parts of the country with little to nothing and having financial problems in those places, I am set on saving a lot before moving to NY. I’m going to read your linked article for more helpful advice. Hi my name is tyree and i currently live in milwaukee wi and all i have is 500 Saved up. Do you think being 18 will i make it movin to a different state? Also able findin a place to stay? Etc i am desperate tryin to move but scared i whould be living on the streets.. Also where whould be the best state to move to? I’m in AZ right now, with my mom, and I’ve made the decision to move as soon as I save up $22000. I’m going to try to secure a cheap appt. and pay the 12 months rent up-front so I can find a job. What do you think? Don’t pay your rent that much up front!!!!!! What if your landlord goes into foreclosure and you’re kicked out on the streets? What if it turns out to be a sham and the apartment you’re ‘renting’ doesn’t even belong to the landlord? What if you feel unsafe or have major maintenance issues the landlord won’t fix? You definitely aren’t getting that money back. I applaud the decision to save up so much money before moving, but you should really not pay more than the security deposit/first month’s rent/broker fee/last month’s rent when you move in. Just keep the money in a separate account so you don’t blow it. Glad I found your site, this is helpful. The new FAQ should answer some of those questions for you. We just put up the most popular reader questions of the year! I lived out there for almost two years… Got stressed financially and moved back to the south.. biggest mistake I ever made… NYC is worth the fight. Hey, when did you live in New York (recently or a while back)? Was New York the biggest mistake you ever made or moving back to the south? If you haven’t moved to NY yet..my advice is do it! The only thing that can happen is you hate it and then you move back. It’s a place I think everyone should experience! Living in NY should never been seen as a mistake lol. I did the same thing!! ..what the heck was I thinking?? I lived there for 3 years and can’t wait to get back..there is nothing like it and never will be. I moved out august 2015 and will be back there Jan 2016 just long enough to save up money before I move back. I am serioulsy considering a move to New York in no more than two years. I am aboslutely addicted to the diversity and feel of NYC. I am a certified English Teacher who recently had to file for bankruptcy after I lost my business. What potential road blocks will I face? Is it easy to secure a teaching job in the city? Are there any decently priced/nice neighborhoods that I should look into for my move? I am on the verge of moving to NY – as a US citizen abroad. I have a place to stay potentially but am trying to line a job up before I go,….should I just make the leap?? I have great transferable skills after having worked in the legal sphere for years, but no-one seems interested. Any advice happily taken! When are you moving to NYC? I think since you have a place to stay and you are sure of your career move then you should take the leap. It is so hard to compete from abroad. I’m moving up there fairly soon, just found an internship and am seeking out potential places to apply to and work once up there. I don’t know what level you are seeking, but maybe starting of with an internship could result in employment down the line? Hello, I have lived in NYC for 2 years going to college and it sucked my finances dry! I had to go back home, take a year off to save money and this year I’m taking online classes with my college in NYC (almost fished with the semester). I’m planning to take my final year of school back in NYC. Do you have any tips on finding and securing an apartment from where I am (Washington State)? Would I need to contact a real estate broker and how much would they generally cost if they were to find me an apartment? Can your dad hire me I’m from London. I’m moving in August–finally. I say finally because I’m doing so after having constantly thought about it for the past 20-25 years. I’m moving with substantial savings, so I’ll be OK. I know the city very well–just in the most recent three years for instance, I’ve been there practically every month. But what I’m worried abous is whether I’m now too old (I’m 45). Hopefully, 45 isn’t too old and neither is 58! @urban, No you`re not too old! NEVER let age or other things deter you from doing anything! Go for what you want and let nothing stop you. NYC isn`t for everone though but it is better you try it out now than never trying at all. Give it a try. Good luck, I hope you make it. Why are you glad you didn’t attend school in the city? i desperately want to move to NYC from upstate NY i know several people there and one friend who i know i could stay with, i have a decent amount of $$$ saved…but need help finding a job any suggestions on where to look. And yes I’m willing to work a crappy job until i find a good one. Thanks i enjoy reading your blog. im 18 and iv always wanted to live in new york iv got £3,500 in uk money but dont knw what that is in new york anyone know? should i risk moving to new york and find myself an appartment and job? Hi Leigh, to found out how much your is worth in America look at the current exchange rate. Yahoo has an exchange rate calculator. I think you have about $5,000-$6,000 in the USA. Secondly, you’d need a work visa or visitors visa maybe. Check the US department of immigration for info on visiting and establishing residence. As far as I know even people from England cannot just jump on a plane come to America and stay and work legally. There is a process with paperwork involved. You want to do EVERYTHING legally so you can stay. Also, are you prepared to work in retail, restaurants and low paying jobs till you find some work you want? Decide what it is your ultimate goal is in NYC and get more skills and experience at home first. The bottom-line is don’t risk anything till you clearly define what your goals are that you want accomplish in NYC. And save save save every penny you get to put toward going to NYC. Good luck. After watching all the BreakingNYC videos online I won’t be happy unless I am in NYC. What do you guys think about roommates?Like the ones you get off the internet. It seemed to work out for ray on YouTube but did he just get lucky? Are most of them weirdos and stuff? Hi Jared, There are many posts here on NewNewYorkers about Craigslist roommates and finding an apartment. Living with “strangers” worked out great, twice, for me, and I would recommend it over living with a BFF any day. Craigslist is good for roommates–you’re a plenty good judge of character and will know if they’re weird! Hello, my name is Jeser and I have been wanting to move to New York since I was a little kid. When I graduated high school, I told myself that I’m gonna try to achieve my dream of living there, but I’m scared. I’ve only $35 to my name and I don’t know anyone there. I need some feedback. The best and only feedback we can give at this point is to SAVE, SAVE, SAVE! You’ll need savings if you’re going to take a smart leap into NYC life. That’s just a fact. Saving money is rough when you’re young, but it’s completely worth it: It may buy you the best years of your life in NYC! Helllo, my name is Brittani. I have dreamed of moving to NYC since I was a little girl and this blog has been most helpful of all my research in the past couple of years of planning. I am currently a senior undergraduate, scheduled to graduate 2012 with a degree in Public Relations. (I plan to move early 2013 Jan-Feb. I have a savings, currently building more credit and paying off debts so financially I will be fine. Brittani, You will be fine moving without knowing anyone, ESPECIALLY as a student. You’ll be amazed how fast things will happen for you — jobs, friends, clubs, activities, favorite places. You’ll find it all in a very short time if you are proactive. My rule was Never Say No. When people invite you out, when you hear about a cool event, when there’s a job fair…say yes! Brittani, I live in Dallas as well and have been seriously considering taking that leap of faith and moving to NYC somtime around then. I have a few friends up there. Maybe we could get together sometime if you’re still considering NYC! Hi Lindsay:-) Yes, I am still absolutely obsessed with moving there lol. We should get together sometime, as we should have much in common given the shared interest! Ill be bringing what i have saved but its not much, any idea where i might be able to meet any recruiters? go to new york with a interview lined up or..just go for it?! hope idont starve..
My name is Ibbi and i’m a certified midwife from Denmark! My Biggest dream is to live in NYC. I’m currently working in Norway as a midwife in a labour ward and with post partum care. Working on saving as much money as possible. I would love to get to know you cause we’re from the same field and we both share the same dream. Maybe you could even tell me about how everything is working out for you? It’s a bit special with me cause i’m a foreigner 😦 Much more difficult. New New yorkers : Do you have any informations about how to move to NYC when you’re european?? Joseph What if they ask for an interview thinking you are in NYC? Wouldn’t that be a bit awkward? One thing to consider is doing work-exchange at a hostel. Some hostels in NYC will give you free lodging in exchange for working shifts, usually 3 a week. Duties could include: front desk work, housekeeping, working the coffee bar (if they have one) or security. They are usually pretty good about working around your schedule and assigning you work that fits your personality. With housekeeping, you are usually free to go once the work is done, rather than a full 8 hr shift like the other jobs. Security is over night, which frees up your days to look for a job/apt. Some people work a regular job in addition to the work exchange at the hostel to save for a decent apt. Tips on getting work-exchange: Jazz Hostels usually have work-exchange. If you really want to do it, book a room and quietly ask around about work-exchange once you’ve settled in. They usually like to keep it a secret. Don’t go into long, crazy stories when interviewing–they don’t want potential crackheads. If you’re fun, laid back, reasonably sane, speak minimum English and they have a few spots open, you’re in. Also, be open to whatever they offer you in terms of work. Beggars can’t be choosers here, but usually they’ll ask where you think you’d fit best. Also, if you can store your things at parents or a storage unit in the city you are moving from, you could sublet a shared apt for $400-$800/month, get an inflatable mattress or find a furnished room. These are abundant in NYC–pretty much every neighborhood. There are tons of free or almost-free things to do in NYC, take advantage of the NYC.gov website and be sure to Google, “free+nyc.” For decent/inexpensive clothing try Uniqlo. Don’t wait around for sales in NYC–it will be gone and they will never have your size, especially if you are small or medium. Katie, Have you considered this: http://www.couchsurfing.org/ It is a great way to stay in NYC for a couple weeks for free. A friend of mine from London used it a couple years ago while he was turning in resumes and interviewing. If you make friends with the people you stay with and explain your situation, they might allow you (I don’t see why they wouldn’t) to let you use their address for resumes. That is all you would need, a NYC address. Good luck. PS My friend said every place he stayed was friendly, clean and safe. Hi, I was born and raised in NY westchester (white Plains) I love NY, its my home, I always will love NY. I left when I was 18 for college, moved to baltimore, MD. Ive been here 10 years and Im looking for a change. I want to move back to NY, but its a tough decision for me becasue I know I will be giving up all my non new york city conviences, like more than one bathroom in an apartment, a walk in closet, central air, dishwashers, all the amenities. I also know what I will be aquiring though, a fact paced life, entertainment, friends, all my family…I’m going to miss the convience and space outside of ny gives me, but I want to move back dearly, can someone help me? i live in a big city in europe. the night life is crazy and it is a city that never sleeps.it is a good city if you have lots of money,there really is no future in a job though. im thinking of moving to nyc but not sure i would make it,scared of not finding a job. i have had a hard childhood so i want to be independent and move away from the people here and just start a new life. i am very attractive thats the only luck i really have.i think maybe i could work in a night club i have heard that pays nice. i have us citizenship i was born in the us and left when i was 3 years old. now i am 21. i dont know were to start so any advidce would be nice. what is the best way to go? Hey I’m 13 and I’m wondering if I should save money up now? I live in England and I want to move to NYC because I’m looking for some life in life if you get what I mean. 🙂 So yeah if you have any tips on what I should do it would be appreciated. Thanks for the post. I was looking to see if I was crazy for having visited only once and falling in love. I do know people there but I’m too independent. I won’t ever move anywhere with out a job and housing arrangements but NYC might be crazy enough for me to consider at least going both without at least a ton of money might be an option especially if I want to enjoy some first and then focus on where I want to live. Shout out to all of you who love the city! Hi, guys! I’m 23 and I plan on moving to NYC by the end of the summer with a very close friend of mine. My other best friend lives in BK and has invited me to crash at her place until I find a job. Currently, I am still living with my parents (free rent) and I have a stable job that pays well (salary). I know NYC will be VERY expensive. I went to a temp agency last week to look for an entry-level admin position, but I majored in animal & poultry sciences (Why? Because I thought I was going to be a vet–oops, didn’t happen!) So, what am I supposed to do with an animal degree?? I have some admin experience (I’m very good at it, btw! ), but there are TONS of people with years and years of experience. I haven’t heard anything back :o( I’ve also applied to several jobs on craigslist with no luck. Should I give up my comfortable, but boring and mundane lifestyle to move to NYC where I have nothing lined up?? My plan is to drop everything I have and give myself 1 month to find a job while I stay at my friend’s, but that seems ridiculous, right? Does anyone have inspirational stories where they just picked everything up and moved to NYC without a job? I’ve read some on this site, which made me feel much better, but I’m still super scared! Seriously, any advice would help!! Please, and thank you! P.S. I’m from northern VA, only 4 hours away. Close, but not close. Kudos to those moving in from REALLY far away! You sound a lot like me…except I’m almost 31 and live in Texas, haha. I fell in love with NYC a few years ago and have been wanting to move ever since. I have never wanted anything more in my life, actually. Sometimes I think I’ve taken leave of my senses to want to leave my own comfortable life (finally comfortable after years of turbulence, so to speak) to start all over, but I think NYC would be worth it. I wouldn’t have a job, either, but I would have somewhere to rest my head for a couple of months and I have plenty of leads. All I can tell you is start doing your research on jobs now to see what all is out there that you may qualify for and just go from there. From what I’ve read, it’s very nearly impossible to find a job in NYC without actually living in NYC unless you know someone who will let you use their address. However, I wouldn’t even do that unless you’re close to moving up there because what if they call you for an interview? You sound like me.. I’m a 25 year old woman but from Denmark. Would you like to exchange emails and maybe get to know each other? Hey! Honestly you sound as passionate about it as me; I love NYC since the first time I went (or even before) haha and I’m also doing it this summer for sure, I’ll have a bit less than 2000 but I’m doing for sure I have a ticket already, it’s worth the struggle if you want it so much; Imagine the stories you’ll have one day about how crazy it was. 🙂 . I’m looking for a room . When are you moving? Maybe we can find something to rent idk! Great article! I actually know a couple of people who moved to New York City with less than a hundred dollars (one of them had nothing and slept in the park for his first three nights here, then got taken in by a synagogue!) and the one good thing that I can say about that is it really forces you to be ambitious about finding a job and not barrel through your savings (you can’t spend money that you don’t have 🙂 ) That said, if I was going to add to the article, I would say, the second you get off the plane (or bus or whatever), print a handful of resumes out and start calling and visiting every temp agency you can find. Also, don’t wait too long to start meeting people, meeting people in New York City is a lot harder than you would think. Join a meetup at meetup.com or start volunteering right when you get here. This will help you expand your network and open up even more opportunities for you. I would also suggest getting a good cheap guidebook for moving to New York City. “The Newcomers Guide to New York City: Living Rich on a Shoestring Budget,” available on amazon kindle (if you don’t have a kindle, you can download it to your computer) is good and very cheap. 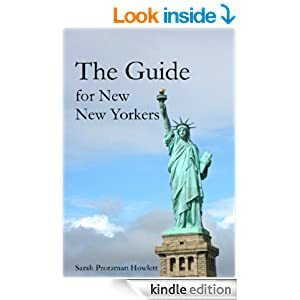 http://www.amazon.com/Newcomers-Guide-York-City-ebook/dp/B008UAQM90/ref=sr_1_2?ie=UTF8&qid=1344546550&sr=8-2&keywords=the+newcomer%27s+guide+to+New+York+City And visit as many blogs and forums as you can so you can exchange ideas and get information from people in your same boat. Good luck to all you newcomers and have fun in NYC! Is it easier to move to the city when you already live in the state of NY but upstate like two hours away? Hey Guys, I’m Paige, I’m 15 and live in Australia. Moving to New York has been my dream until, pretty much forever. I just feel I belong there, if that makes sense. I plan to move when I’m 18 but have only a bit over $100. I have just started looking for a job so am hoping to save as much as I can. Somebody else said it on this comment section; that yes, obviously it’s better to have money saved before moving, the more the better. That applies anywhere. but like this person said some are more headstrong than others and sometimes people like to have every possibility and variable covered and some (like me) are set on a goal and are determined even knowing it will be tight at first but knowing that nothing can stop them. 🙂 I’m moving this July, I have 1200 saved right now and I’ll have a bit short of a 2000 when I move. My job is not great where I live but it’ll allow me a transfer to NYC even if it’s just a part time there. So that and the saved money will give more than enlighten time. I don’t mind staying in a room I’m just so in love with the city that for me all the difficulties are part of the experience. 🙂 . I just found this blog is really great. Does anybody know besides craigslist where else can I meet people/roommates to rent rooms from? I already posted my personal description on CRAIGSLIST and what I want. But I want more options where I can meet people looking for roommates is this blog a place where that can take place? Ahhaha if anybody knows or is actually looking let me know!! Are you in nyc now? I am 22 about to turn 23 in a couple of weeks. I had made the effort last year to move, but my guilt leaving my family behind forced me to stay home. Well I haven’t enjoyed my year here and I feel is time to leave. I want to go before my birthday, I have no money. But I have a strong mindset and know this is what I want. I am prepared for the adventure. Can I get some helpful tips on how to handle money. And any other tips would be helpful. Hi !!HELP!! I AM A high school student living by myself I want to know if I moved to NY so is it possible for me to afford(rent and other stuff) myself in NY with part time job with high school please reply me…….